BTC/USD has its first upside target at $5,228 where the confluence of the following levels awaits: the SMA 5-1d, the SMA 100-1h, the BB 15min-Upper, the BB 4h-Middle, and the SMA 10-4h. Further up, the next upside target is $5,355 which is the meeting point of the previous weekly high and the Fibonacci 38.2% one-day. 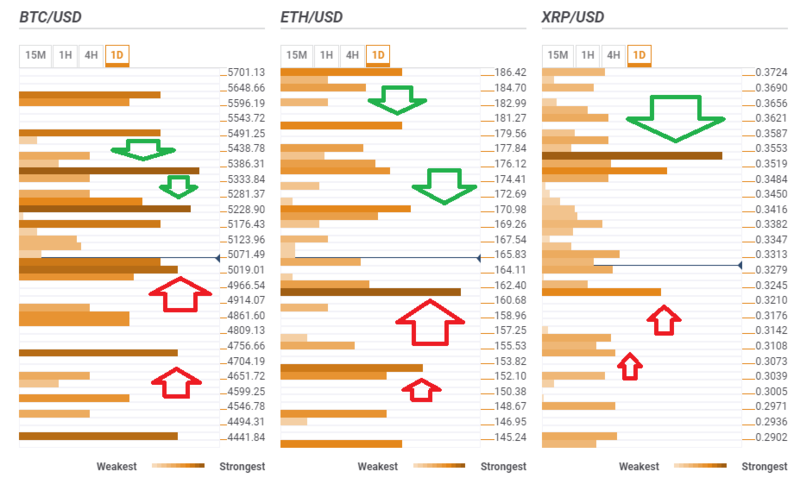 Ethereum has a very clear support line at $161 where the previous 4h-low, the PP one-month low, the PP one-day S2, and the BB 1h-Lower converge. Vitalik Buterin's brainchild's next support is $153 which is a juncture including the SMA 200-1d, the PP one-day, the BB one-day Middle, and the PP one-month Resistance 1. ETH/USD has an initial upside target at $171 which is the confluence of the BB 15min-Upper, the Fibonacci 23.6% one-week, the SMA 50-4h, the PP 1d-S1, the previous daily low, and the SMA 50-15m.